Or as I like to call it: “The Best Coleslaw I have Ever Made & Eaten”. It’s basically mouthfuls of flavours and textures that everybody likes. 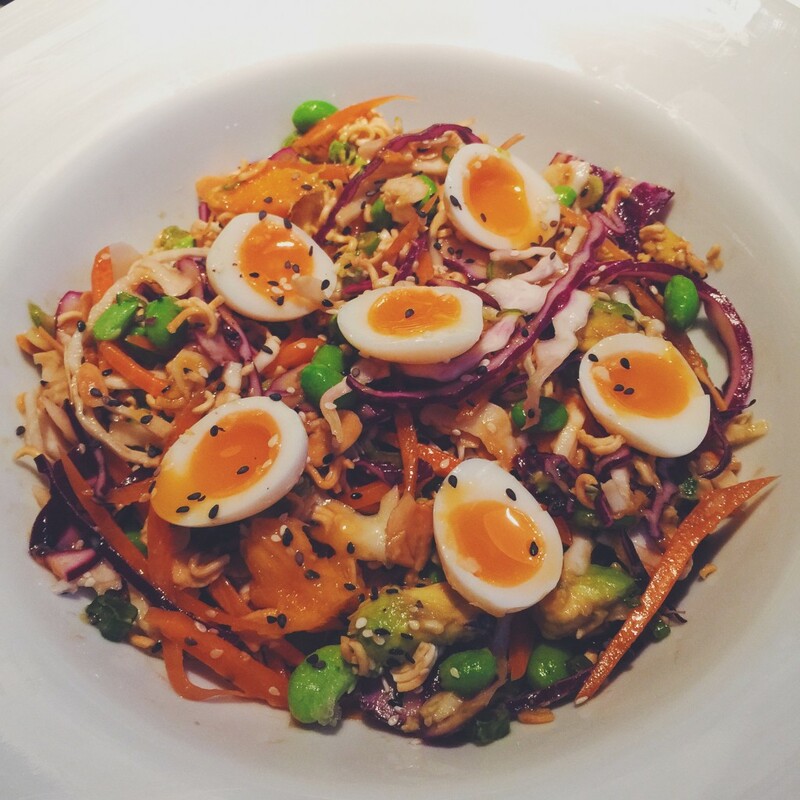 “Hawaiian style” means you have those tropical fresh flavours with a Japanese twist. Hapa food at its scrummiest, and it’s so pretty! It’s a winner of a salad. I promise you, fully paid up members of The Carnivore Club will gobble this salad down in delighted surprise at any sunny barbecue. The best and fanciest elements of this salad dressing are the Yuzu and Umeshu flavours, which are citrusy and floral in scent, lifting it from the claggy mayonnaise typicaly found in conventional slaws. You can buy these ingredients along with your pre-shelled edamame at most oriental supermarkets, but I would opt to pop into one specialising in Japanese products to be sure I get the Yuzu juice (or even fresh Yuzu if you can find them!). Set your oven to 150°C. This salad is all about prep work and very little cooking! I would go ahead and mix up the salad dressing now or in advance so the flavours have time to meld together. Got a mandolin handy? Get it out to make short work of slicing the cabbages finely and the carrots into match sticks. After cubing the mango and avocado, squeeze the lime over them to stop them turning brown. If you want the optional quail eggs, pop them into boiling water for 2 minutes if you want them soft-boiled or 3-4 minutes for hard-boiled. When done pop them into cold water before you peel them to stop the cooking process. Then peel them and set them aside, when you’re ready to serve slice them in half and arrange on top. With your ramen packet still closed, crush up the instant ramen into small nibbly pieces, then open up and discard the seasoning sachets enclosed (because MSG central!). Now scatter the noodles over a baking tray. Add to this the almond slices and toast them both together in the pre-heated oven, you want them toasted golden brown. Keep an eye on them and give them a shake occasionally to brown evenly, they should take around 10-15 mins. When done, remove them and set them aside to cool, then add the sesame seeds to the noodles and almonds. Don’t dress the salad or add the dry crunchy ingredients until you’re ready to dish up. But you only need to mix everything up and serve! 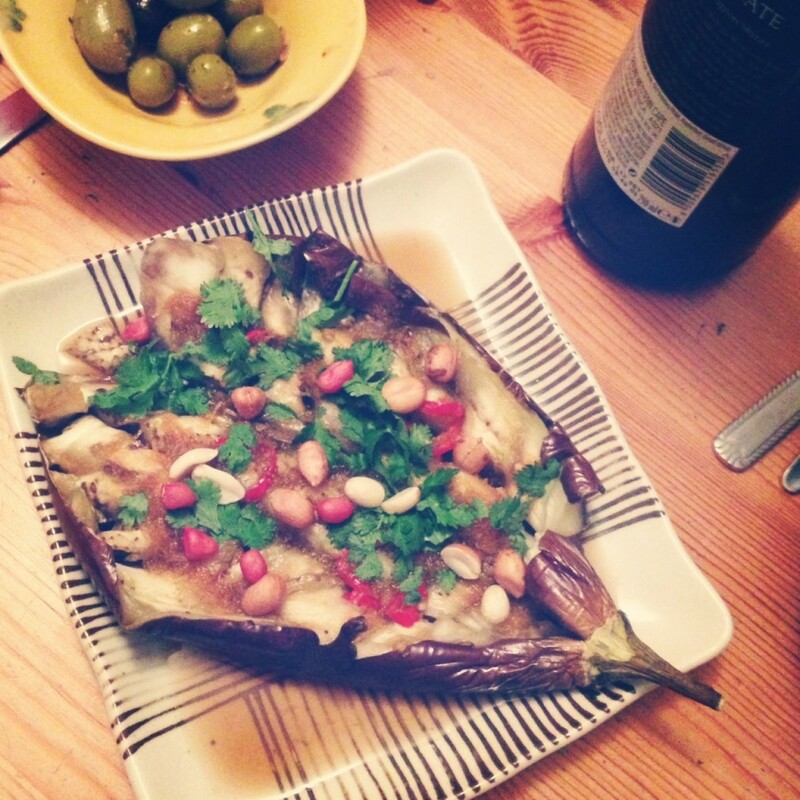 Aubergines are in season and this dish is one of my favourite and simplest dishes to rustle up with said veg. But mostly its the delicious nouc cham that I love, so crack open an empty jam jar and make a load of this addictive sauce. Mix up the fish sauce, sugar and water. Add to this the garlic, chilli, lime juice and shredded carrot. Thoroughly stir it all up and keep it in the fridge until you’re ready to use. Now you’re ready to grill your aubergine. Get the grill on high. Pierce your aubergine near the leafy bits a could of time to stop the Exploding Aubergine from happening (this has happened to me twice…I had to scrape the oven clean of the perfectly cooked bits of veggie shrapnel). Put the whole aubergine in whole and just keep an eye on it, turn it ever so often and the skin doesn’t burn beyond the nice charred flavour. Depending on your oven and grill it should take about 20-40 minutes. If you want to can oven roast it first at around 200°C then finish it off on the grill. Once it soft and sagging you’re ready! Place the aubergine on a dish and slice it open. Add to this the nouc cham sauce, the toasted peanuts, coriander and spring onions. Happy Year of the Snake everyone! Last week my little kitchen was burning the candle at both ends to get some delicious treats out for a CNY party last night, which I literally decided to throw on Monday. A surprising amount of people agreed to come considering the late notice, it being a Sunday and the snow, so a warm glowy feeling was had by ushering the new year over great food and friends. As per usual at my foodie parties, people had to be rolled out, so the following posts here at Minikin Kitchen will really be me catching up with what I cooked throughout the week ending with the on the day dumpling making sessions. 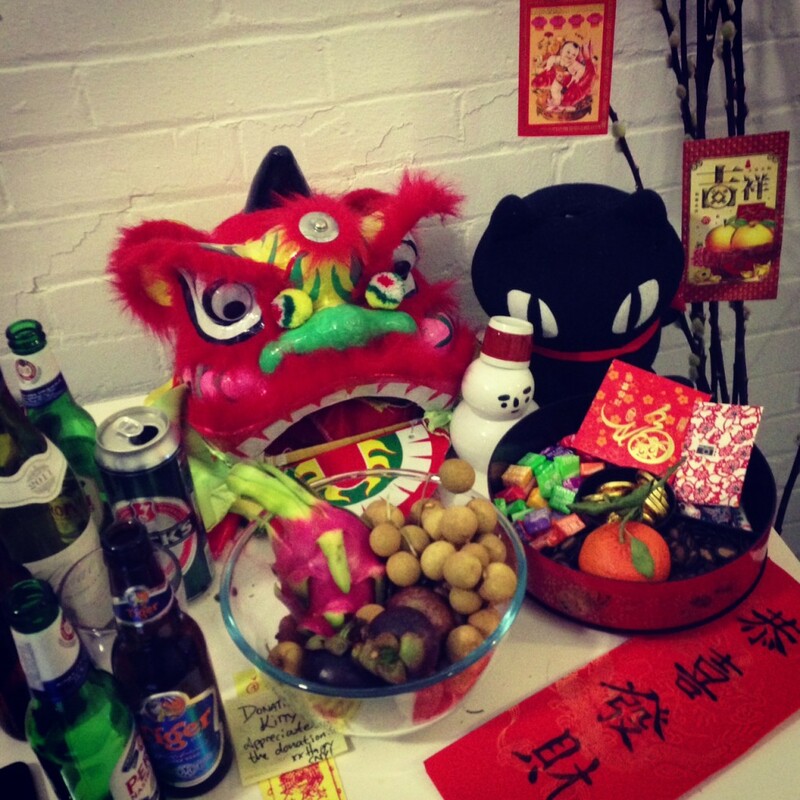 Ahhh…Chinese New Year. I love you. So. 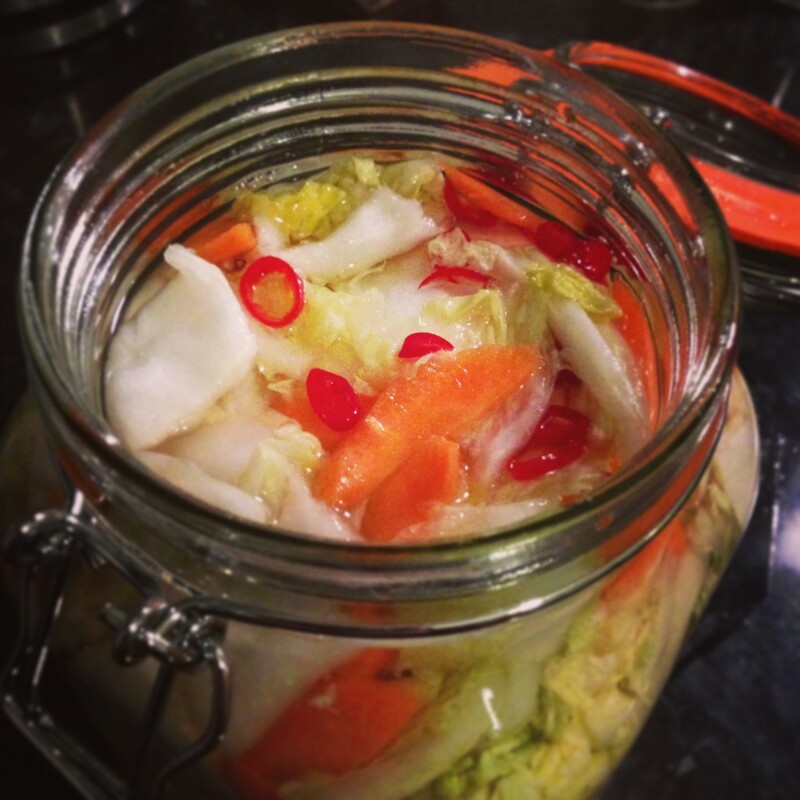 Let’s start with this spicy, sour and slightly sweet offering of chinese pickled cabbage. My veg box last thursday happened to contain Chinese Leaf (or Nappa Cabbage across the pond) as well as carrots. Serendipitous or what? You can if you want substitute the Chinese leaf with a head of regular white cabbage, which will result in a firmer bite. 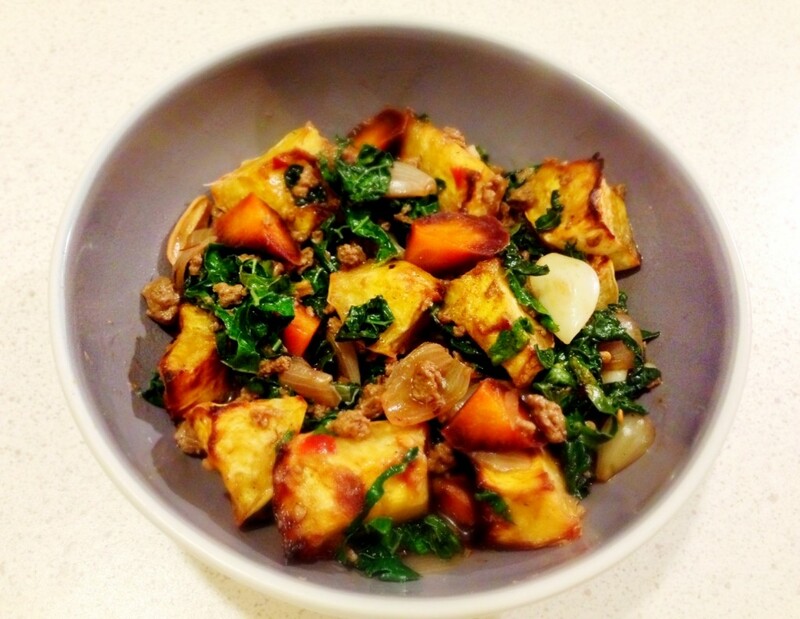 This is pretty easy side dish to prep in advance. Cut and put all the veg in a large tupperware box or jar, anything with a lid strong enough for you to shake everything up. Heat up the vinegar and dissolve all the sugar and salt. Once it’s all dissolved add the rice wine and the peppercorns. Now add this to all the veg and shake it all up. The veg will shrink in volume over time adding loads of water to the mixture. What I ended up doing is whacking it all in a big Kilner jar and every morning and night rotate and stand the jar upside down (or right side up) to shift and coat it all. I made this on the Thursday evening and did a taste test Friday evening, so these quantities are the results of my adjustments. Serve it up using a slotted spoon or chopsticks, you don’t want to serve it swimming in the pickling liquid. It does have a spicy kick, and although my friends enjoyed it, I’d start with 2 chillies and do a taste test a day or two in. I really like spicy food, but I’m into enjoying food not enduring it. As the title suggests, this is a Chinese stew type dish which really reminds me of wintertime in Hong Kong. And after these past few cold rainy days, I really needed some HK styled comfort food. The type that has gloriously squidgy textures and an oyster saucy gravy that goes divinely with plain steamed rice. This is rather hilariously made with posh versions of all the 3 main ingredients of pumpkin, carrots and kale (Casperita squash, purple carrots and cavolo nero), obviously you can substitute with the more easily found versions in your grocery isle. I’ve also used Quorn mince instead of proper meat mince, if you would like to use real meat, go for pork mince. Failing that, turkey or chicken. Oven to 170°C. Chop up your squash and cut it into smallish chunks, I left the skin on because I like the extra texture after roasting, toss them in a bowl with a bit of oil, white pepper and some salt. This is probably where the recipe isn’t strictly Chinese as not everyone has an oven back home, but I really like the slight crisping of the edges roasting provides. Roast until tender about 30-40 minutes. While that’s roasting. Pan on the stove. Medium-high heat. Heat the oil then sauté the garlic and shallots until slightly tender. Add your smashed cardamom pod, star anise and cinnamon and fry to release some nice smells. Now add your mince and brown a bit. Carrots, the 1/2 cup of water, oyster sauce and the chill bean paste go in next. Cover and cook until the carrots are tender. The kale goes in last for a couple of minutes. Taste and adjust seasoning.